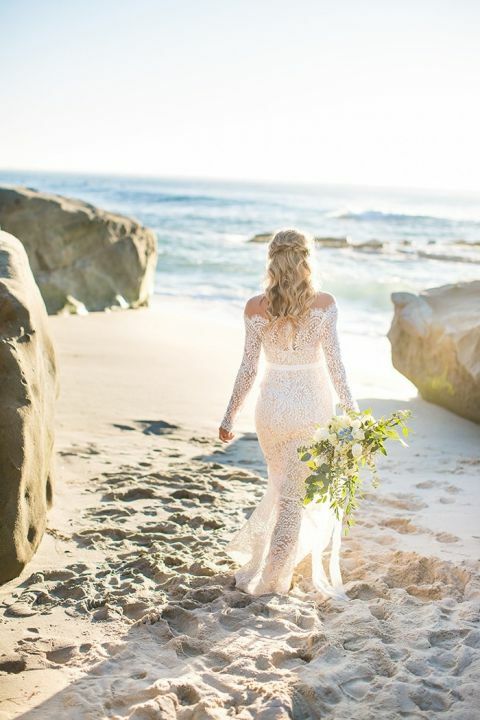 Escape from the everyday with this intimate coastal elopement shoot – a barefoot beach bride in the perfect boho wedding dress, sun kissed wedding portraits, and a gorgeously on-trend circular ceremony arch! 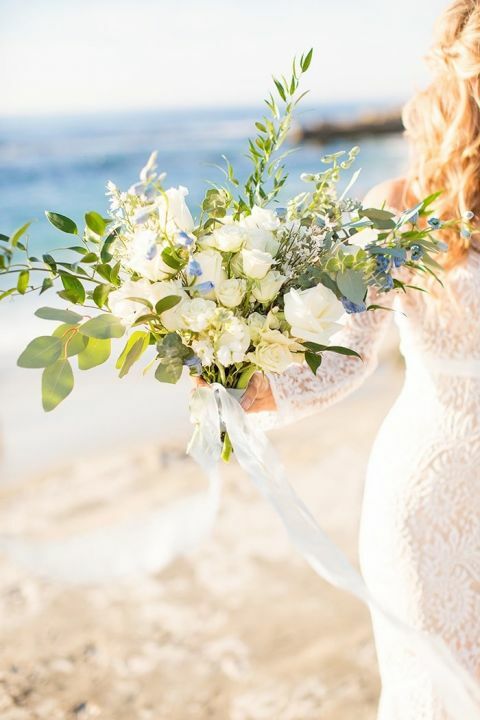 Wheeland Photography and Le Champagne Projects took advantage of the San Diego weather to create a wintery beach wedding shoot that would be just as stunning in any season! Le Champagne Projects drew inspiration from the cool tones of the sea to create this elegant coastal elopement – sea glass blue and frosted green echoed the wintery waves while playing beautifully off the circular floral arch that created a stunning ceremony backdrop. 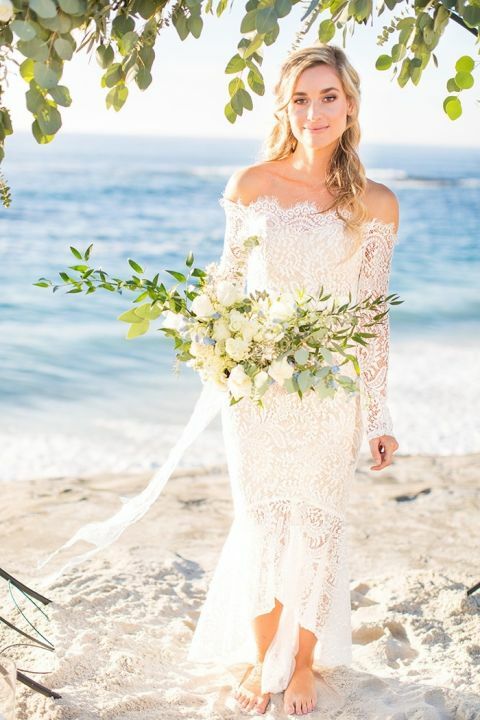 The bride’s off the shoulder lace trumpet dress from VICI struck the perfect balance between boho chic and coastal casual. Courtnay Schafer paired it with a romantic half updo with a braided crown and loose, beachy waves. The groom’s effortless style combined a floral print bow tie with relaxed suspenders. The gorgeous circular ceremony arch by Le Champagne Projects made for a spectacular showpiece against the San Diego cliffs. 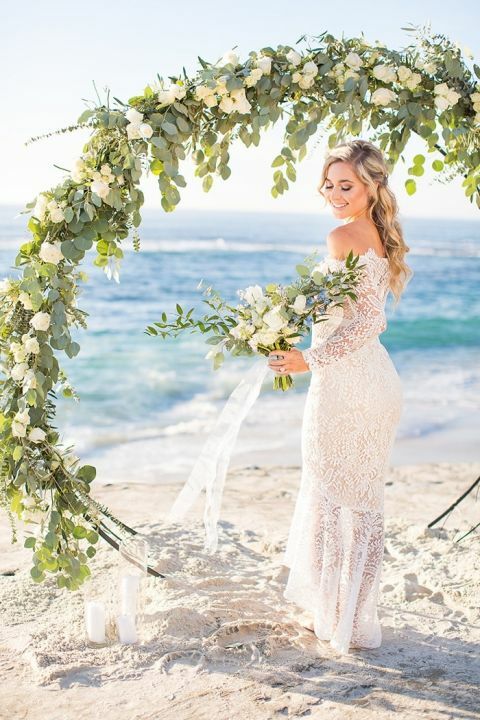 The elegant and organic style made the perfect backdrop for the barefoot beach bride in her fitted lace dress. The organic greenery and white flowers in the arch were echoed in her hand tied bridal bouquet and the groom’s simple anemone bouquet. After an intimate ceremony against the cliffs, the couple made their way to a table set in the sand, set with chilly blues and greens from the patterned place settings and silk runner. Jenny Wenny Cakes designed the simple one tiered cake with an agate inspired pattern in soft mint green. The music loving couple enjoyed an acoustic jam session in the sun soaked sand to celebrate their wedding day. As the light began to fade, they made their way back to the cliffs to enjoy the breathtaking sunset. Their intimate beach wedding day capped off with a magical sparkler exit!